A few months back, rumors of a physical Google Wallet card surfaced, suggesting that Google would give you a credit/debit card that could access your Google Wallet balance and be used for purchasing goods. We waited and waited, expecting it to show up at some point as a single card you could use in your wallet since Google Wallet the NFC mobile payment service had yet to take off. For whatever reason, it never did arrive – well, until this morning. One of our readers was prompted with an option to order one, which led us into digging a bit more to see if the service was really live. Turns out it is. We’ve already ordered ours. The Google Wallet Card allows you access your Wallet Balance in the real world at ATMs, banks, and wherever MasterCard Debit is accepted. The card lets you pay with whatever you have in your Wallet balance, so it doesn’t exactly replace all of your other cards like we had once envisioned. It’s essentially a lot like the American Express service called Serve. What you’ll have to do is load up cash into your Wallet app to make it available for use. With the Google Wallet Card, you can now spend your Wallet Balance anywhere MasterCard® Debit is accepted in the US, online or in stores. Simply hand your card to the cashier like you would any credit or debit card. If you select “debit” at the point of sale, you’ll have to enter your Wallet PIN when prompted for your card PIN. If you need to provide a zip code to complete your transaction, use the zip code associated with your Wallet’s home address. The amount in your Wallet Balance is what you have available to spend, up to a limit of $5,000 per 24 hours. This limit doesn’t include cash withdrawals at ATMs or banks. Once the card has been ordered, it should arrive within 10-12 days. 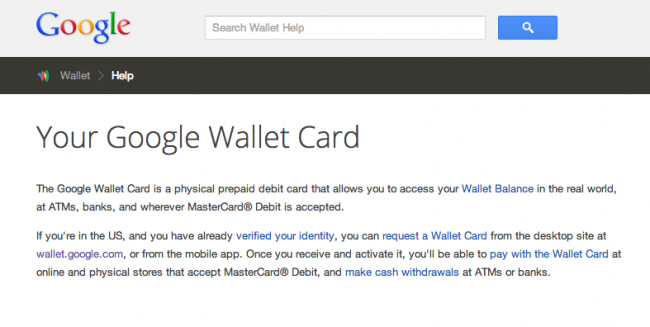 You can order your Google Wallet Card here.